One would think that the habit of dropping the football before crossing the goal line in a real-life game would be easy enough to not develop. Yet, since DeSean Jackson’s infamous early celebration against the Cowboys in 2009—just two weeks into his NFL career—it’s been a terrible tradition that has persisted in all levels of play. 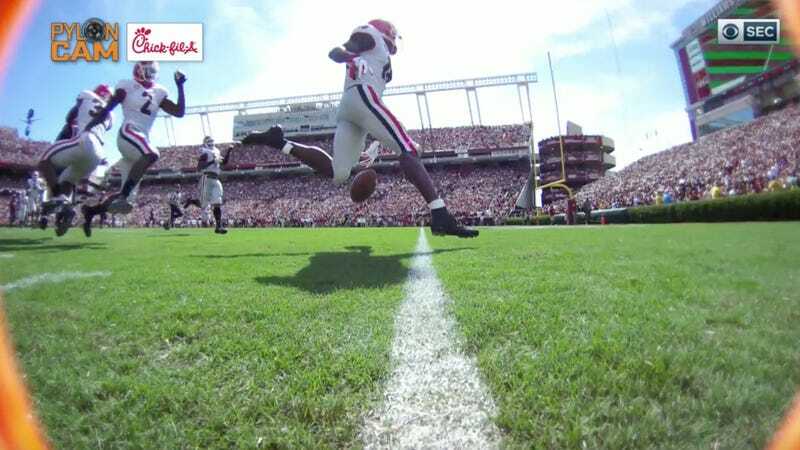 The latest member of this infuriating club is Georgia cornerback Deandre Baker, who turned a 57-yard pick-six into a one-yard fumble return for a touchdown. The interception is infuriating in its own right as the ball bounced off the hands of an open South Carolina receiver, but Baker puts the cherry on top of the whole play with the drop at the end. The winner of this situation, however, is Juwan Taylor, the Georgia linebacker that saved this blunder from being a full-blown disaster. This sort of mistake happening, but still resulting in a touchdown, is a good enough excuse to remind everyone about the time Chad Johnson dropped the ball before crossing the goal line in the 2000 Fiesta Bowl, and it still counted.